As an African literary aficionado and enthusiast one cannot but marvel at the proficiency and prolific nature of Eurocentric writers - not that it stops them from garnering heavy flak from readers and critics! 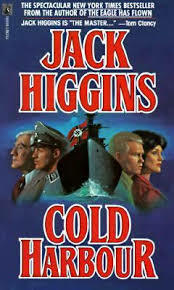 Like now I have just read one of Jack Higgins almost 100 novels, titled Cold Harbour. Can one conceive of an African author writing even 20 books or novels?? Yes a handful exist- a couple of Kenyan writers like Meja Mwangi, and David Maillu; Kalu Okpi, and Cyprian Ekwensi of Nigeria, Asare Konadu of Ghana...but such writers are thin on the ground. Okay so it shows that the Eurocentric world has always valued literacy and literature since the days of Charles Dickens for one. But there are so many illustrious writers in Europe and America that one ends up stumped, in essence. But back to Higgins and this work. Here he has created some memorable characters, male and female. Craig Osbourne a savvy American agent, for one, and of course the intriguing woman, Genevieve Trevaunce. Yes the story dates back decades ago to the times of the Nazis, which again reminds us of how the western world accretes countless creative writing weaved around their history.